Ideally suited for heavy stock removal with high degree of accuracy combined with economic method of grinding for engine block, cylinder head, refractory bricks and many other rgeneral engineering components. » Bed is a single piece high tensile strength casting, heavily ribbed for better vibration damping and shock absorption ensuring rigidity to the machine. » Precision scraped V & Flat guideways for table with forced feed continuous lubrication. Turcite lining for GVS 40. » Rectangular, box type turcite lined guideways for wheel head. » Rapid movement of wheel head by electric motor for faster setting. » Hydraulically operated auto infeed at each table reversal along with inching feed. 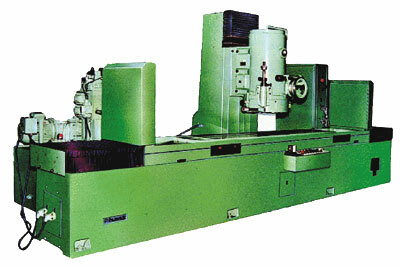 » Built in motor drive to the grinding wheel head. » Hollow spindle for better coolant supply to ensure full power utilisation. » Grinding head tilting facility for hollow grinding. » Hydraulic table traverse for infinitely variable speed and smooth reversal. » Speed regulation of table in GVS 40 with remote operated proportional valve. Table stroke sensed by limit switches. » Built in safety interlocks.